O This is the beginning of the checkBudget() function. It initializes the currentDate variable to the value stored in sessionStorage (i.e., the value entered by the user in the Settings panel) and sets the dailyBudget variable to the value stored in localStorage (i.e., the date the user taps on the Dates panel). © Start a database transaction in preparation for calculating the total calories for the current date. O The first parameter is a prepared SQL statement that uses the SUM function to add up all the values in the calories column for the entries that match the current date. © The second parameter is a single-value array that will replace the question mark in the prepared statement on the previous line. © The third parameter is an anonymous function that will be called if the SQL query completes successfully (we'll look at this in detail momentarily). Q This line grabs the current total from the first row of the result. Since we are just asking for the sum of a column, the database is only going to return one row (i.e., this query will always return one row). Remember that the records of the result set are accessed with the item() method of the rows property of the result object, and that the rows are zero-based (meaning that the first row is 0). 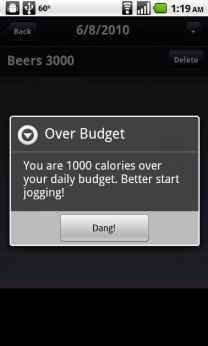 O Check to see if the current calorie total for the day is greater than the daily budget specified on the Settings panel. If so, the block that follows will be executed. 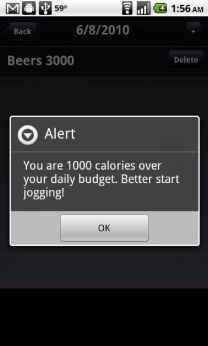 © Calculate how far the user is over his calorie budget. © Compose a message to display to the user. (D This is a try/catch block that attempts to call the beep(1) and vibrate() methods of the navigator notification object. These methods only exist in PhoneGap, so if the user is running the app in a browser, these methods will fail and execution will jump to the catch block. Since there is no browser-based equivalent to beep or vibrate, the catch block has been left empty. © The fourth parameter is the name of the generic SQL error handler that will be called in the event of a SQL error.